Note that this is only a thruster. No stability and flight controls. - A radial impeller on top can be dangerous. Anything sucked in on top, becomes a dangerous projectile. - The air had to travel a long way to get to the curve, making it turbulent. - The largest surface is at the edge, so; better start the airflow there. - It's not efficient to bent the airflow down all 90º. To about 70º can be optimal. - A larger volume of air is more efficient and less noisy. I haven't been able to test or calculate, if creating thrust this way is more efficient than direct thrust. I guess it mainly depends on the amount of ambient air being sucked into the airstream, and the weight of the craft (relative to a traditional aircraft). But efficiency isn't all that matters. A helicopter is less fuel efficient than tube-wing type of aircraft in forward flight, but it has the advantage of VTOL, so there it is. This coanda type of VTOL could possibly replace the helicopter rotor. 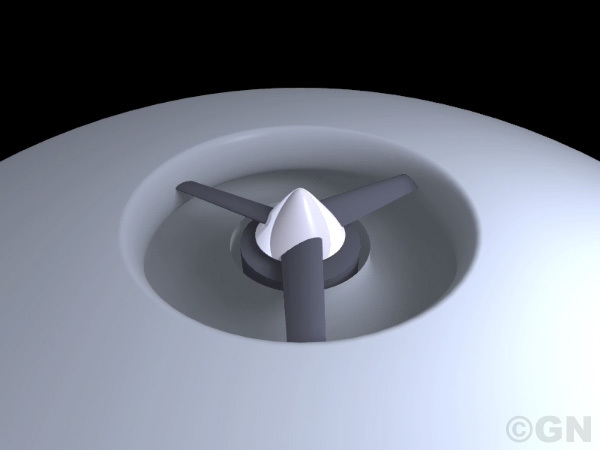 Lift during forward flight can come from its disc shaped body. And the body's disc shape is a very good shape for space travel. An ordinary passenger aircraft weighs thousands of kilos. The jets it has produce only hundreds of kilos of thrust, not enough to lift the aircraft vertical. Instead of vertical take off, they propel the aircraft horizontaly. This way the aircraft builds up a large speed relative to the ambient air. Air weighs about 1.2 kg/m3 at sea level. The wings of the aircraft can now accelerate thousands of kilos of air downwards, and lift the aircraft up. The jets of an aircraft on the ground, accelerate some air to high speed. This produces a weak repulsive force relative to the wings that accelerate a lot of air slowly. Conclusion is that it's more efficient to slowly accelerate a great lot of air-mass. The problem of a VTOL aircraft is that the airspeed during vertical take off or landing is about: zero. It doesn't meet thousands of kilos of air it can kick down. So, how can a heavier then air aircraft be fuel efficient during vertical take off? I guess it can't be efficient. But it is efficient if you can land just about anywhere, not having to fly to large airports. It is efficient if you don't have to carry the weight of large wings and landing gears. It's efficient to not have a rotor in forward flight. Note: The goal isn't to accelerate air downwards. The goal is to fly. The atmospheric pressure at sea level is amazingly high: about 1 kgf/cm2. That's about 10.000 kilogram of force per square meter! Lowering the atmospheric pressure above a surface of 1 m2 with only 10% will already cause a lifting force of about 1000 KG! And as a result of doing so, the ambient air accelerates downwards. This type of VTOL disc can take of anywhere, transfer to horizontal flight as soon as possible, fly really high, accelerate there (less air resistance) still using the atmosphere as part of the repellent mass. Horizon take-off into space. Far more efficient than today's rockets that burn tons of fuel just to get that 1G. 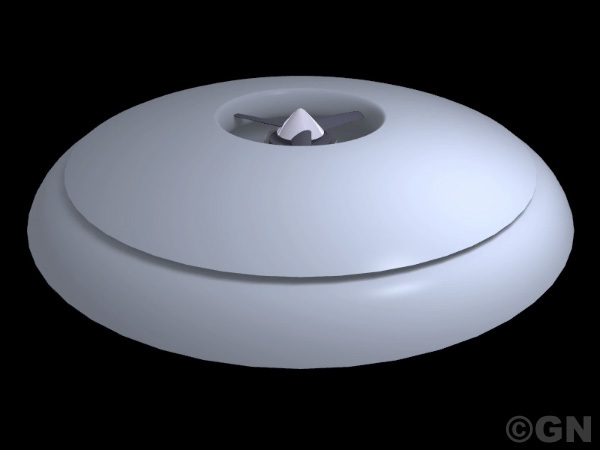 It kind of makes no sense to have a flying disc with large air holes passing through it. And what to do when that one engine fails? 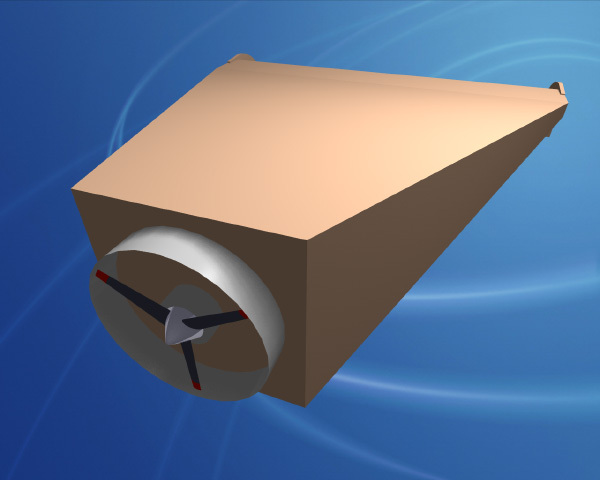 Near the edge of the flying disc can be many small engines driving the coanda effect. The air slots of each coanda cell can be controled individualy, and closed while in forward flight.